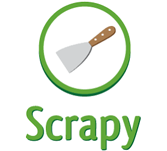 Scrapy is an open-source web crawling framework written in Python and is used for extracting data from the web page with the help of selectors based on XPath. This tutorial is useful for software programmers who are interested in learning Scrapy web crawler from scratch. Before proceeding with this tutorial, users should have a basic understanding of Computer Programming terminologies and Python and basic understanding of XPath will be a plus.